For a long time now I’ve been talking about, debating and even writing about starting up a Patreon page. To be perfectly honest, I’ve been working on one for a while now (and have mentioned it a few times on this blog), but I’m beginning to tire of simply working on it and not putting the plan into full action. At this point nearly everything is complete for the page, and so I’m making the official announcement now that my Patreon page will launch on March 1, 2017. I would have launched it sooner, but I’ve been crunching under a very tight deadline presently and juggling some personal matters. Plus with next week’s No Such Con I just don’t think I’ll have enough time right now to launch and promote a new campaign. But, in an effort to pin myself down and commit to something, I figure it’s best to make an announcement with a date. 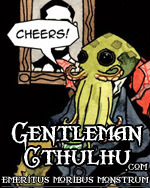 For those interested, I’ll have a number of rewards available, including listing patrons’ names on all of my websites, early access to Gentleman Cthulhu comics, early previews of in-progress work, and access to story notes and the like. Amongst the things I will be offering as rewards to patrons (at certain levels) are going to be sketch covers for both Chadhiyana #0 and Gentleman Cthulhu: Year One! I’ve already printed up a limited number of Chadhiyana sketch covers, and may offer a few to convention goers and through my mailing list (so if you’re going to No Such Con next weekend, ask about them), but I’m trying to come up with as many exclusives for the Patreon page as I can–to make it worthwhile for patrons to contribute. That said, for anyone who has actually been reading about my plans to launch a Patreon and getting excited about it, I do apologise for the wait. I’ve been trying to make sure the page looks great, the rewards are solid and easy to understand (plus realistic for me to fulfill), and all of this whilst trying to keep up with a number of other things and trying not to be too perfectionistic about it. But we’re now twenty one days from the launch of the page, and hopefully all of that hard work will pay off. As I said at the beginning of the year, I’m going to do my best to make 2017 and 2018 something special (despite the dark cloud that seems to be lingering over our country right now and which is having its effects on me), but as Albert Einstein once said, “in the middle of difficulty lies opportunity” (I actually have the quote on a poster in my office), and I do believe that we are sometimes at our best when we are met with challenges–and launching an on-going crowdfunding campaign is going to be a challenge, in and of itself.